Ree69 needs no introduction krappa. 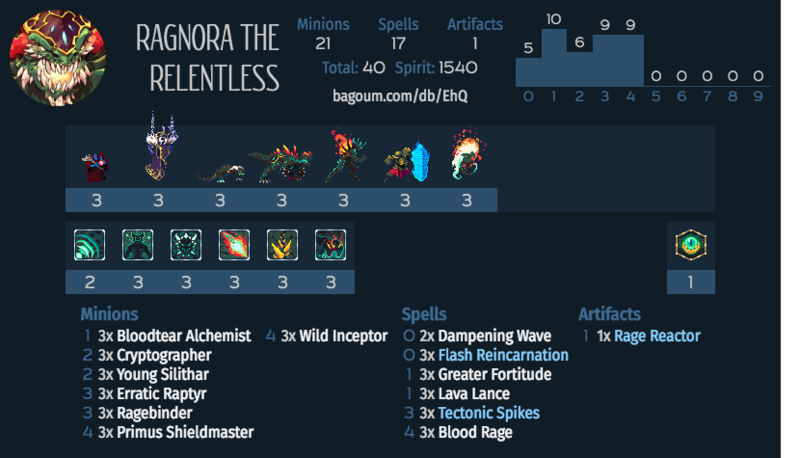 So this deck began as a way to ease myself into the whole “budget to S-rank” climbs many S-rankers do to pass time. “Ease” was an understatement. Budget Ragnora tore up ladder, carrying me from bronze to ~rank 3 at which point I switched to faie for the majority of the remaining climb because even on a budget, rag was broken, fighting constructed decks on equal turns and cheesing veterans and noobs alike out of existence. Net result of the two decks was bronze to s in 95 wins (rag’s wr was notable better despite queueing into the same players, allowing them to play around combos). Cycle bloodrage early. This is not a true bloodrage combo deck (see @akurane et. al.). Rather, treat this card as you would killing edge– something you topdeck for lethal or hold in the midgame as you craft a lethal. Only exception to this rule is when playing vs a ziran in high gold or better, as a bloodrage on a ragebinder or shieldmaster generates a body she will likely be unable to deal with (lower tier zirans generally run sunbloom and martyrdom, so be wary to throwing this out in silver, saving it instead to pump a massive ripper through lancer buffs). Probably the most powerful budget deck in the game as of the time of this writing, complete with 20+ dmg lethals, galaxy brain plays, and a learning curve challenging enough for noobs and S-rankers alike. I actually switched to Faie in diamond because this deck felt too dirty. Is crafting prismatic versions of all the cards worth it? Eggmar list piloted by Niklaren in the playoffs of the Meltdown League.